Social Media has become a part of our life and people are truly curious about every single app being rolled into the market. Whenever people enter into the New Year, they obviously look forward to new happenings and events. People always wish something good to happen in their lives even in terms of their social life. The technology has developed in such a way that people are witnessing numerous changes in the current era. Various social media platforms have emerged on the internet that made every task pretty simple. Digital Marketing sector has acquired immense buzz and popularity all over the globe. It has brought tremendous changes in the viewpoint of the public towards online marketing. Due to the incredible transformation, there is an ultimate scope of the business people worldwide. Marketing renders a plethora of career opportunities for all the people. Social Media plays an important role in the success of every businessman in the field of digital marketing. Hard work will definitely provide some fruitful outcome at the end. Likewise, the usage of social media also gives maximum productivity to all the marketers. To get the victory in this field, the marketers must and should implement strategies and tactics. As we are intimating with different social media platforms every now and then, it is eventually important to understand the latest changes in social media. Most specifically, the digital marketers and the business people should be updated mandatorily about the social media updates 2017. 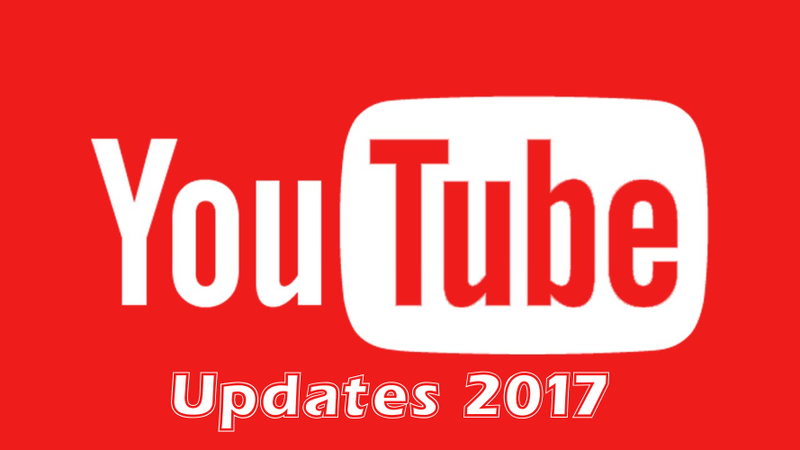 In order to help our readers, we have listed out the latest updates and changes that took place on different social media websites. 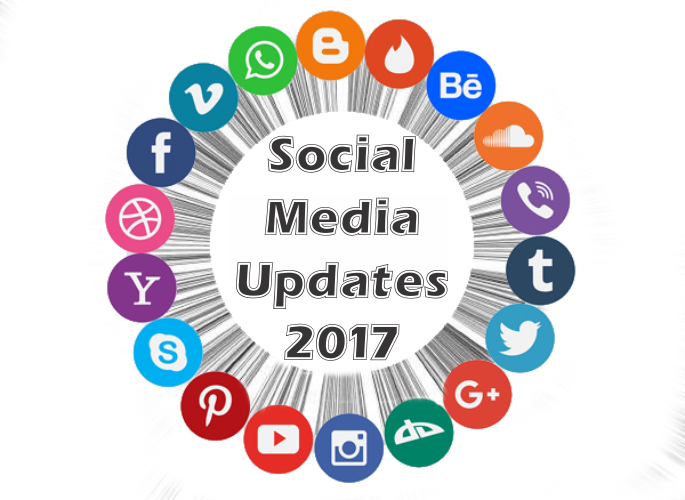 Check out this detailed compilation of the Social Media Updates 2017. Have a glimpse! Social Media is the term which has gained a prodigious reputation all over the globe among the public. To know the latest happenings that occurred in social media platforms this year, this post helps you in the best way. With the advancement of the modern technology, hundreds of thousands of apps, messaging platforms have emerged on the web. Through these messaging apps and communication resources, it has become extremely simple to interact with the near and far ones. Some of the popular social media platforms include Facebook, Twitter, Instagram, YouTube, Snapchat, Pinterest, Hootsuite, LinkedIn and a lot more. An extensive range of changes took place in social media among all the aforementioned platforms. It is very important for every digital marketer to have adequate knowledge about the latest changes that befell on the internet. To improve one’s business, they need to execute some of the best marketing plans using the powerful resources. Social Media is one such effective resource that helps the digital marketers for their business expansion and growth. Every year and every month, the developers of different social media platforms will bring new changes. The transformations can be witnessed on almost all the active platforms in order to deliver the best user experience for all the people across the world. Based on the popularity and the requirements of the users, the website developers will make social media changes. 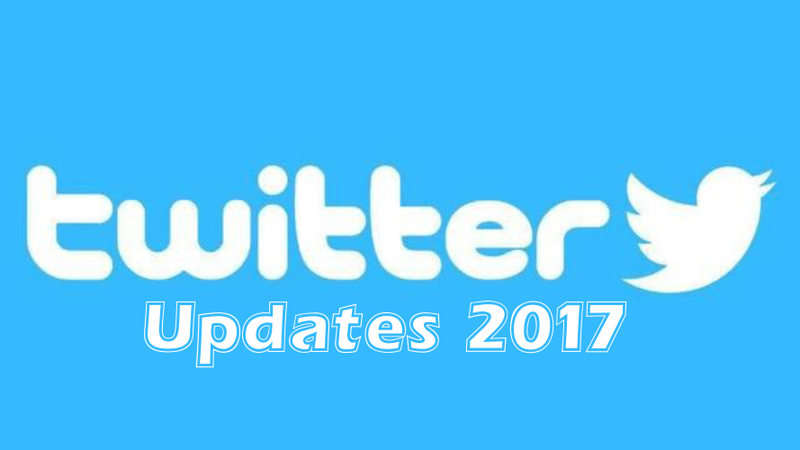 In this article, we have generated a massive list of the best social media updates 2017. Facebook, the popular social media platform has undergone several changes this year. The social media updates on Facebook shows a dramatic impact in the field of digital marketing. Facebook has already rolled out a wide range of updates to enhance the experience of the users. Some of the best features of Facebook include voice and video calls, conversations via text messages, emoticons, stickers, Facebook Marketing and a lot more. For the digital marketers, Facebook helps them by all means. The best source of income for the digital marketers is undoubtedly Facebook. On this social media platform, one can witness several benefits and advantages for both common people as well as the business folks. As we all know, Mark Zuckerberg is the founder of this social media platform. There are lakhs of brilliant people working in this company to bring numerous changes to the social media platform. In the year 2017, Facebook has come up with copious updates by rolling numerous features to it. 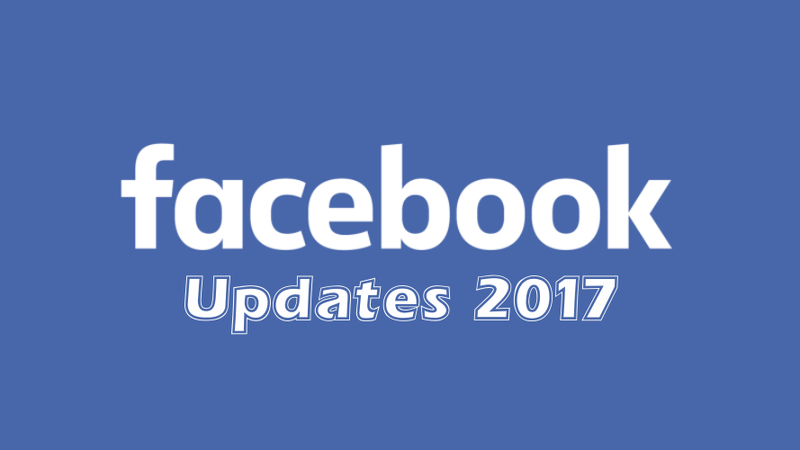 We have compiled a huge list of the social media updates 2017 on Facebook. Facebook, the giant social media platform has rolled out an exclusive option of muting the pages and people. With this option, it has generated massive buzz among the public. It is one of the beneficial features for all the people. There are some people who don’t like following or be a friend to them on Facebook. In such a case, the other person might understand if they unfriend or unfollow them. To overcome this situation, Facebook has launched this incredible feature to mute people and pages. This option can be seen just by tapping on the drop-down menu appearing on the chatbox of individual people, page or a group. Another latest social media update on Facebook is the introduction of recording GIFs within the app. One can easily record the live GIFs by making use of the camera feature available on Facebook. In general, the GIFs appear only for a few seconds. Despite the appearance of the GIFs for a few moments, this new feature has brought numerous changes to it. One can easily add effects and frames to the GIFs and record them within the app. Facebook has rolled out another fantastic social media update with the name Workplace Chat. This update allows the employees to interact with the entire organization using accustomed tools. These tools help the workers in the best way to transform their ideas into action. It will become a great benefit to the development of the business. The Workplace Chat feature has been rolled out into the market on Facebook as a desktop application. This is an essential feature of all the businesses that let the users share their screen with their colleagues. It lets them work in a much more collaborative manner. In 2017, the social media website has launched numerous options to the Facebook album. It allows the users to add videos, check-ins, text posts to the albums. There is a possibility of following the albums of friends so as to receive notifications whenever updated. Twitter is the best micro-blogging website designed and developed for the ease of the users. This is another popular social media platform that has immense user base all over the world. On Twitter, the developers have rolled out numerous features and social media updates for amazing user experience. Some of them are listed out below. One of the best social media update 2017 launched on Twitter is direct message buttons. In the month of June, this microblogging website has launched this option to enhance the ability to add buttons to direct communications for various businesses. Using this feature, one can easily add a minimum of 3 buttons to any of the web URLs. Apart from this, one can easily include the links to different features present on Twitter. The usage of text buttons is completely customizable and the usage of the emoji too. With an intention to take an action exterior to the conversation like composing tweets, following accounts, etc., Twitter has rolled out this update. Another popular and beneficial social media update is in-app video feature. It lets the users upload the videos on Twitter sans navigating to the third party application. This particular social media update on the micro-blogging website will enhance the tenacity of the app and helps in engaging the users in the best possible way. In the month of June 2017, the developers of Twitter have launched a new design for this platform. This particular design has been rolled out to iOS, Android, twitter.com, Twitter Lite and TweetDeck platforms. The new design shows the real-time count of the number of likes, re-tweets and the replies received for a tweet. The profile pictures on Twitter will appear in a circular shape instead of the square shape. 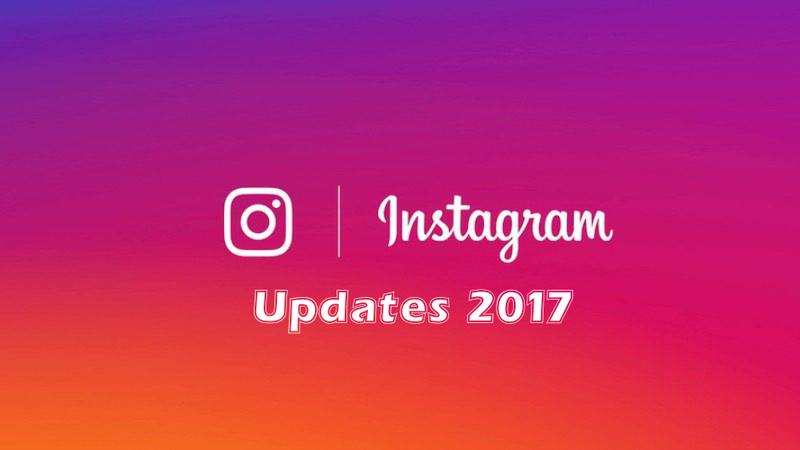 Instagram stories will be made compatible with the desktop and the web versions very soon. It lets the users share the Instagram stories with their pals from the desktop. This particular update is truly beneficial to all the marketers that let the people expand their stories to other folks. Instagram has made an announcement regarding the addition of face filters to this platform. It has added a range of 8 filters to Instagram as the best social media update. Some of them include glasses, animal features, etc. LinkedIn is another powerful social media platform that carries out various operations through websites and mobile applications. 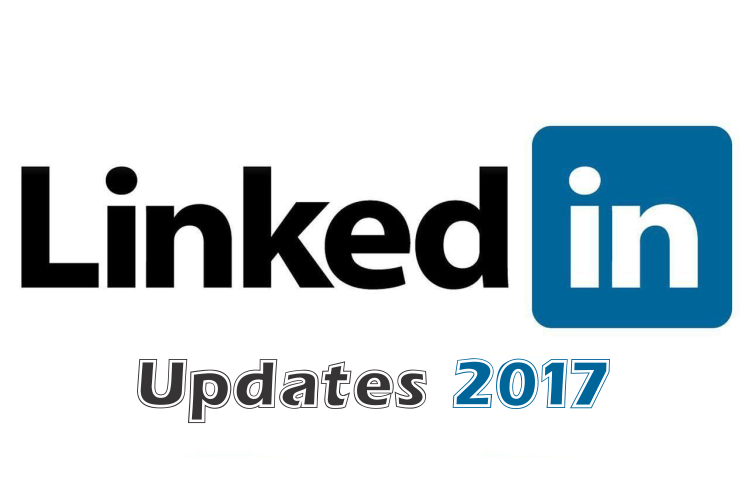 Check out the list of social media updates rolled out on LinkedIn this year 2017. What are the Techniques in Digital Marketing?